We’re not clowning around. The Baskets TV show on FX has been renewed for season three. Zach Galifianakis, co-created the comedy series with Louis C.K. and Jonathan Krisel. The FX TV series stars Galifianakis, Louie Anderson, Martha Kelly, Ivy Jones, Gary Clemmons, and Jason Clemmons. Baskets follows Chip Baskets (Galifianakis) a struggling clown in Bakersfield, California. Learn more from from this FX press release. LOS ANGELES, March 9, 2017 – The acclaimed and award-winning FX comedy Baskets starring Zach Galifianakis has been renewed for a third season, it was announced today by Nick Grad and Eric Schrier, Presidents of Original Programming, FX Networks and FX Programming. Baskets, co-created by Galifianakis, Louis C.K. and Jonathan Krisel, won the Emmy® Award for Outstanding Supporting Actor in a Comedy Series (Louie Anderson) and the Critics’ Choice Television Award for Best Supporting Actor in a Comedy Series (Louie Anderson) during its first season. In season two, the Baskets family is at its most fragile. Losing his wife and his rodeo job, Chip (Zach Galifianakis) jumps on a train to get the hell out of Bakersfield, but a gang of gutter punks, the police, and a sudden death drag him right back into the drama he tried to escape. Dale’s (Zach Galifianakis) marriage crumbles as his unrequited love affair with Martha (Martha Kelly) deepens, and Christine (Louie Anderson), who dedicated her life to her sons with little affection in return, takes her own happiness into consideration for once —and finds romance on the way. 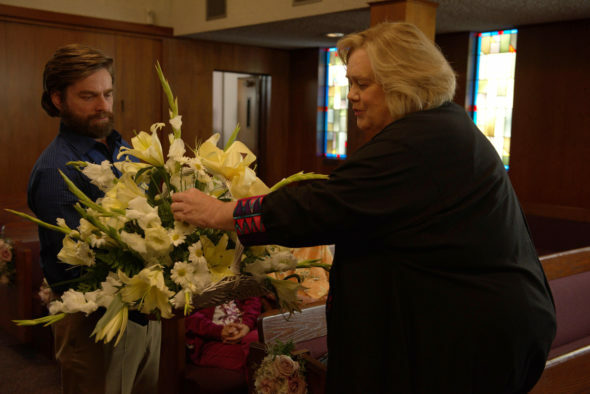 Baskets continues tonight on FX (March 9, at 10 PM ET/PT) with Episode 8: “Funeral” – Someone trying to punch Logan in the face accidentally punches Cody. Chip attempts to sort it out. Written by Jonathan Krisel & Rachele Lynn; Directed by Jonathan Krisel. Baskets was co-created by Executive Producers Jonathan Krisel (Emmy Award-nominated writer and director, Portlandia, Saturday Night Live, Man Seeking Woman), Louis C.K. (Emmy Award-winner, Louie), and Zach Galifianakis (Emmy Award-winner, Between Two Ferns with Zach Galifianakis; Birdman: Or (The Unexpected Virtue of Ignorance); The Hangover and its sequels). M. Blair Breard, Dave Becky, Marc Gurvitz, Andrea Pett-Joseph, and Anna Dokoza are also Executive Producers. The series is produced by FX Productions. The second season of Baskets is averaging a 0.21 rating in the 18-49 demographic and 496,000 viewers. Compared to season one, that’s down by 23% in the demo and down by 16% in viewers. Find out how Baskets stacks up against the other FX TV shows. What do you think? Are you happy the Baskets TV show has been renewed for a third season? How would you feel if FX had cancelled this TV series, instead? More about: Baskets, Baskets: canceled or renewed?, Baskets: ratings, FX TV shows: canceled or renewed? Baskets on FX: Cancelled or Renewed for Season Four? I hope BASKETS will return AGAIN. Love this wonderful show. Such drama, fun, chaos, love, and human interaction going on. Just happened to watch it once and never stopped. Amazing portrayal by Zach and touching mom played by my fave, Louie Anderson. I am so glad to hear it is coming again for 2018. Although my husband and I don’t fit the demographics we love it. He is 69 and I am 73.
any news about season 3? So glad to hear season 3 is coming. As with the ending of each show, I’m anxious to see what happens next. Each episode is interesting and bizarrely funny…like a cult classic. I often forget that Zach G is actually playing 2 characters the whole time. My favorite show. Ten shows a season is just not enough. But I appreciate the depth of character development. Now we understand (and feel for ) not only Chip but Mama and Dale. So glad they’ll be back at the rodeo. Hope they bring back the old rodeo guy. So glad!!! One of the best shows I’ve ever seen. Thanks so much for renewing Baskets for season 3. I would have been heartbroken if it was canceled. Truly enjoyable television. If “Baskets” were to be cancelled, it would be a loss to FX. Other than the excess of commercials and limited episodes, “Baskets” is a hit!